After more than 50 years of extensive water diversion for urban and agriculture use, a major settlement was reached among the U.S. Departments of the Interior and Commerce, the Natural Resources Defense Council, and the Friant Water Users Authority in an effort to restore the San Joaquin River. The settlement received Federal court approval in October 2006 and established the San Joaquin River Restoration Program, a multi-agency collaboration between State and Federal agencies to restore and maintain fish populations, including Chinook salmon, in the main stem of the river between Friant Dam and the confluence with the Merced River. This is to be done while avoiding or minimizing adverse water supply effects to all of the Friant Division contractors that could result from restoration flows required by the settlement. The settlement stipulates that water- and sediment-quality data be collected to help assess the restoration goals. 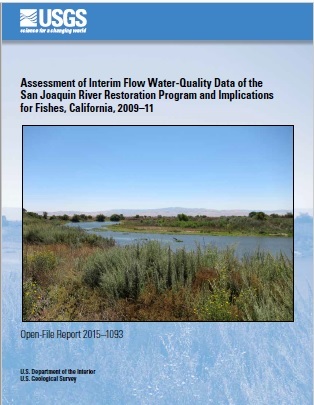 This report summarizes and evaluates water-quality data collected in the main stem of the San Joaquin River between Friant Dam and the Merced River by the U.S. Bureau of Reclamation for the San Joaquin River Restoration Program during 2009–11. 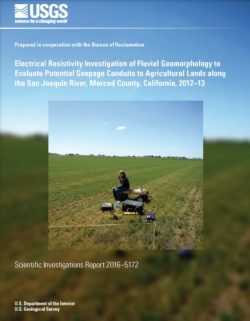 This summary and assessment consider sampling frequency for adequate characterization of variability, sampling locations for sufficient characterization of the San Joaquin River Restoration Program restoration reach, sampling methods for appropriate media (water and sediment), and constituent reporting limits. After reviewing the water- and sediment-quality results for the San Joaquin River Restoration Program, several suggestions were made to the Fisheries Management Work Group, a division of the San Joaquin River Restoration Program that focuses solely on the reintroduction strategies and health of salmon and other native fishes in the river. Water-quality results for lead and total organic carbon exceeded the Surface Water Ambient Monitoring Program Basin Plan Objectives for the San Joaquin Basin, and results for copper exceeded the U.S. Environmental Protection Agency Office of Pesticide Programs’ aquatic-life chronic and acute benchmarks for invertebrates. One sediment sample contained detections of pyrethroid pesticides bifenthrin, lambda-cyhalothrin, and total permethrin at concentrations above published chronic toxicity thresholds.